Editor’s Note – We can become ‘yardfarmers-without-borders’ by inspiring people across the world to become a part of the movement towards sustainable agriculture. This article is a great example of how that can happen. Europe, and Scandinavia in particular, are often front-runners of sustainable innovation and environmental consciousness. However, Livia Urban Swart Haaland, one of the founders of the Copenhagen urban farm ØsterGRO, took inspiration from the world’s largest rooftop farm, Brooklyn Grange, in New York City. After visiting Brooklyn Grange, Haaland returned to Denmark. In the spring of 2014, she launched an urban farm and community supported agriculture program (CSA) atop a former auction house for cars in Copenhagen’s Østerbro neighborhood. Kristian Skaarup and Sofie Brincker joined Haaland in the endeavor. ØsterGRO covers about 600 square meters (about 6500 square feet) in comparison to Brooklyn Grange’s roughly 10,000 square meters (100,000 square feet), but for its size and age, it has already captured the attention of Danes and foreigners alike. During the CSA’s first year, 16 families bought a share, which includes six months’ worth of weekly bundles of fresh produce, eggs and honey for about $450. In 2015—only its second season—40 families have shares, and there’s a waiting list for next year. Fresu believes the connection of volunteers, shareholders and visitors with their food and where it’s grown creates something special. When shareholders pick up their produce every Wednesday, they are welcome to take home small potted chili and tomato plants for balconies and can pick a bouquet of the wildflowers. Not far away, DYRK Nørrebro was founded in 2011 as a mission to transform the dismal rooftop of the Blågård School in Nørrebro, one of Copenhagen’s more culturally diverse neighborhoods. “It was an ugly gray place where teachers would come to smoke,” says Marikka Møller Stenak, a law student and Dyrk volunteer. 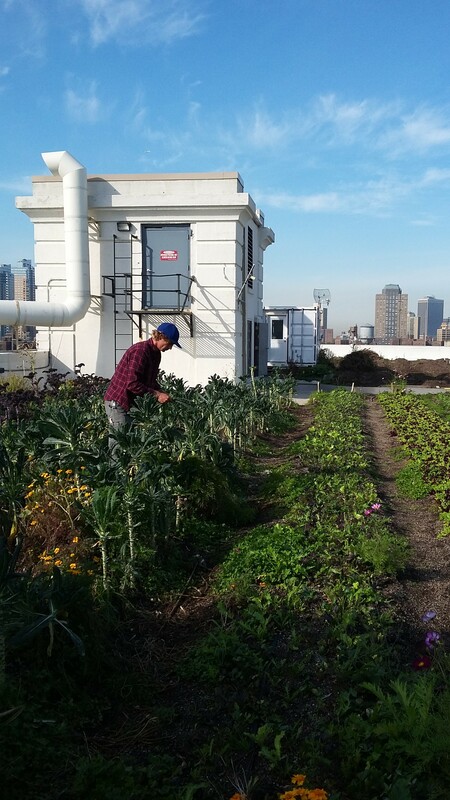 Now, the rooftop is filled with plant beds, a small greenhouse, a workshop and a new chicken coop. The farm is small, about 250 square meters (3000 square feet), so unlike ØsterGRO, DYRK’s harvest is only available to its volunteers. But anyone is welcome to join the team, which is diverse and spans “all social layers” as Møller Stenak puts it. She and her husband joined DYRK after attending a seed workshop and fell in love with the space. DYRK and ØsterGRO acquired their initial grants and funds from their local governments. 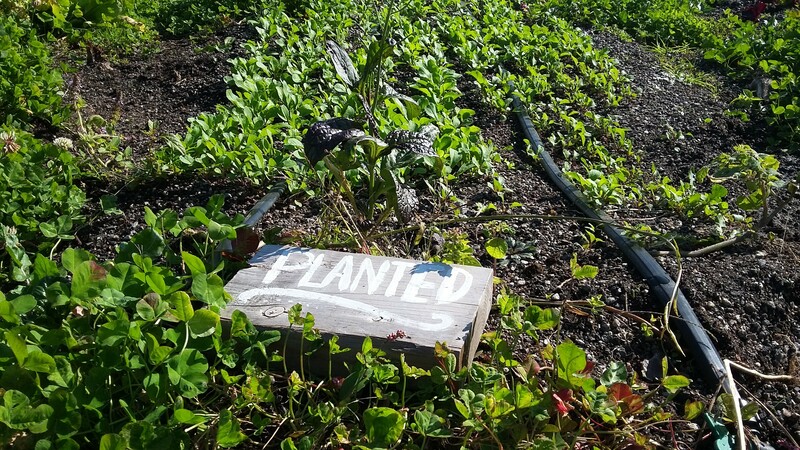 Fresu says that the money was not hard to obtain; government officials realized the social and environmental value an urban farm provided their neighborhood. Fresu began as a dedicated volunteer but now receives a stipend for her work. ØsterGRO’s received an initial grant from the Copenhagen Climate Quarter and one from the Fund for Organic Agriculture for about $45,000. Today, ØsterGRO applies for grants for certain projects but no longer receives funding directly from the city. The farm funds itself through CSA shares, offering tours and workshops, renting out the farm for events and renting a small greenhouse space to the localStedsans restaurant. In DYRK’s case, the neighborhood’s local council donated an initial grant amounting $11,200. The farm also received a grant from a local green partnership for about $5,200. Both the local council and the green partnership are sub-organizations of the municipality of Copenhagen. Møller Stenak says that DYRK generates a small portion of its income by hosting public events: they’ll set up a pop-up cafe, sell extra plants and have a donation bowl. But because DYRK is noncommercial, the Nørrebro local council still funds the farm’s major expenses, such as their new chicken coop. ØsterGRO’s commercial model resembles Brooklyn Grange’s. Brooklyn Grange began with a mix of public and private funds. The founders received a grant from the New York City Department of Environmental Protection as well as loans, fundraising, crowdfunding and private equity. The farm sells produce to local restaurants, retailers, its 60 CSA shares and at farm stands. It also generates income by hosting public events and by renting out the farm. Fresu says that in her experience, people seek out ØsterGRO on their own. She says that personal responsibility is a strong part of Danish culture. Resources are available, and it just takes a bit of digging and dedication to find them. “If you are interested [in something], you have to do the first step,” she says.